Vantage Point Advisors, Inc When Do You Need A 409A Valuation Update? 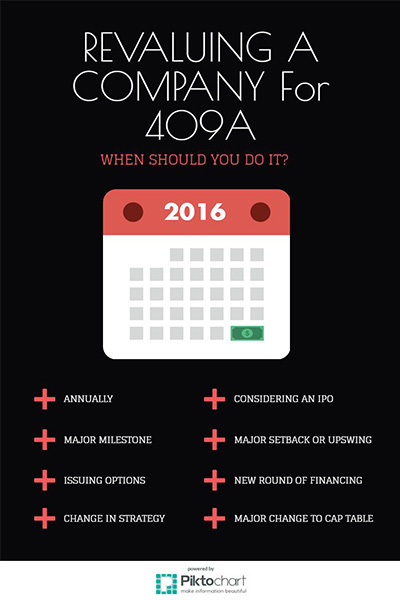 When Do You Need a 409A Valuation Update? The safe harbor disclosures within the 409A guidance generally recommend an annual 409A valuation update. If the company is operating to plan and there haven’t been any major deviations from management’s annual operating plans—both financial and strategic—there generally isn’t a need to update the analysis more than once a year. If the yearly safe harbor lapses and the company is still performing as expected, your valuation advisor will most likely use the same valuation methods as the prior year, which will save time and costs. However, if there were significant changes to the business plan or the company closed a new round of preferred financing or even debt, where a new value was placed on the business, the methodology may need to change and a new valuation may be warranted. Typically, when a new round of institutional financing closes, a new value is placed on the company. This assumes that the investor(s) and the company have negotiated at arm’s-length and that the transaction is at “fair market value”. These transactions can imply an increase in value (up round) or decrease in value (down round). Either way, any change in the overall business enterprise value means that the value of the individual share classes (preferred stock, common stock, options, warrants, etc.) will have a corresponding change in value as well. This is the most common circumstance requiring an update to an existing 409A analysis. Achieving a major milestone is another reason a company may consider updating a prior analysis. The most obvious industry in which this applies is in the biotechnology sector. For example, “de-risking” a company’s core technology asset by successfully completing Phase 1 clinical trials and moving into Phase 2 implies that value has increased for existing shareholders. As such, the value of the overall business has likely increased. In this case, an update is a good idea because of the risk associated with granting stock options to employees or company officers based on a stale analysis. Without an update, the company is at risk of granting “in-the-money” options, which could expose stakeholders to IRS scrutiny, additional taxes, and penalties. When questioned by a governing body, it’s difficult to argue that the company had a considerable value creating event and the underlying common stock didn’t increase as well. Not every situation requiring an update is going to be positive. Sometimes, unforeseen difficulties can impair the business enterprise value. For example, failure to achieve a specific milestone may result in a company resetting expectations or changing a business strategy altogether. In cases like this, valuations will likely decrease and can serve as an opportunity to grant options at a lower price than if the company been executing to plan. As companies begin considering an initial public offering (IPO), the company’s auditors and the Securities and Exchange Commission (SEC) will mandate that certain valuation models be utilized. Models that were acceptable prior to beginning the IPO process are no longer considered “best practices” in an IPO situation. Although there may not be any business-specific reason to update an analysis, complying with auditors and the SEC makes for a much smoother IPO review process. Over time, companies that have gone through numerous rounds of financing often experience major changes to their ownership structures or capitalization tables (cap tables). Oftentimes, certain provisions will require the company to issue an increasing number of securities, resulting in cap tables that are difficult to manage and understand. To reduce the complexity, businesses will often recapitalize (recap) their existing cap tables. In doing so, ownership rights and preferences often change along with the value allocated amongst share classes. For accounting purposes, it is beneficial to update a previous 409A analysis so that all options are aligned with the current rights and preferences of the new cap table. Why Should You Revalue Your Company? Should changes occur within the company or economy, having an updated analysis will provide a level of assurance that the company is not issuing options based on old or misleading analyses. Failure to do so may put shareholders at risk and expose them to unnecessary IRS audits. In the end, if the company is not issuing a significant number of options, it may not need to update its 409A other than annually. And as always, it’s best to discuss the company’s specific situation with both legal counsel and the firm’s auditors to ensure that proper compliance is being maintained. 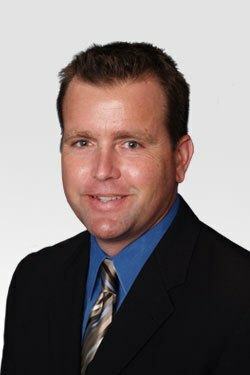 Mark Sadauski is a Director at Vantage Point Advisors, Inc. He is a Certified Management Accountant and Certified Valuation Analyst. Mark is also a member of the Institute of Management Accountants and the National Association of Certified Valuation Analysts with a strong background in stock-based compensation (ASC 718 and IRC 409A), embedded derivatives (ASC 815), purchase price allocations (ASC 805), goodwill impairment testing (ASC 350) and fair value (ASC 820).